When someone arrives at your home, your front door is one of the first things that they’ll see. A tired, faded front door can make even the most beautiful of homes seem a little neglected. 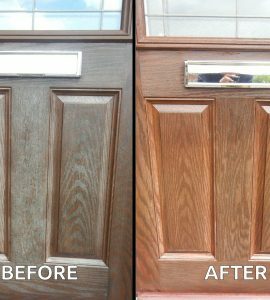 Exposure to rain, sunlight and pollution can all contribute to making your front door look as if it’s seen better days. The good news is, is that there is a quick and easy way to restore the color and appearance of your front door without breaking the bank. A deep penetrating oil, Polytrol color restorer penetrates through the surface of your front door and re-wets the pigments, to restore your door’s original color and shine. Designed to form a tough and long-lasting flexible finish when it dries, Polytrol doesn’t leave any kind of ‘film’ on your front door, so will not peel or flake. But don’t just take our word for it. Take a look at our before and after photos of a wood effect composite front door, restored using Polytrol. 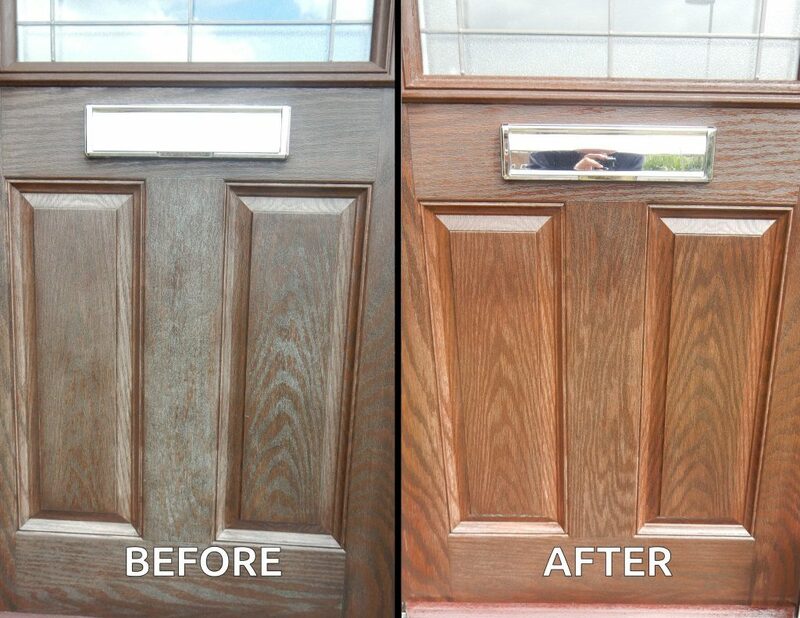 We think you’ll agree that the ‘after’ photo looks like a brand new front door. It’s important that your door is free from any dirt, grime, grease or mildew, so give it a good clean with some warm soapy water. Tip: If your front door has mildew on it, just scrub it with a 50:50 bleach and water solution and leave to stand for about 10 minutes, before rinsing. Any waxes or polishes should also be removed. When using Polytrol, it’s important to work in areas that you can complete in 10-20 minutes. As most front doors are quite small, you can usually do it all in one go. Use a brush or a cloth to liberally apply Polytrol. If you notice that some bits are looking shiny and others are looking matte, move any of the surplus oil over to the matte areas. Polytrol only takes between 10-20 minutes to work its magic. After this, it’s time to wipe off any excess product with a clean, lint-free cloth. You’re done! Just leave your front door to dry and admire your work. You’ll need to clean any tools you’ve used to apply Polytrol with white spirit. It’s important that any rags you have soaked in Polytrol are properly discarded or they could spontaneously catch fire. See Polytrol’s full instructions for more information. Want to know more about Polytrol and its many uses? Get in touch today – we’d be happy to answer your questions.